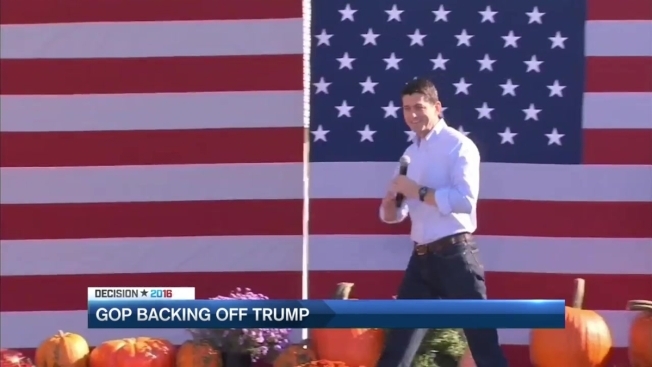 Between reaction to a now-infamous video, House Speaker Paul Ryan's all-but-projecting a win for Hillary Clinton and defections from high profile Republicans, you might wonder how Donald Trump's campaign is surviving in a battleground state like New Hampshire. "This didn’t affect trump whatsoever," said New Hampshire Trump campaign adviser Al Baldasaro. "The campaign and the GOP is 100 percent behind Donald Trump." Baldasaro says the New Hampshire campaign is going strong, with volunteer door-knockers and phone-callers out in full force. He says the only one negatively affected by Sen. Kelly Ayotte pulling her support is Ayotte herself. "I might vote for her, I might not," Baldasaro said. The adviser also said Ryan is "worried about his establishment people." "They weren't supporting Trump anyway," he said. "In the voting booth, they'll probably vote for Trump over Hillary." Trump surrogate Fran Wendelboe, a former New Hampshire state representative, took it a step further. "I think if anything, it could be helpful for him, because those people are just fed up with the establishment and fed up with Washington," she said. Wendelboe thinks backlash from the Trump video has been offset by a generation of voters who didn't know about Bill Clinton's past. "Didn't even know the name 'Monica Lewinsky,'" she said. "Didn't know Bill Clinton was impeached. I think that probably has been a silver lining." Maine Gov. Paul LePage, meanwhile, reiterated his support for Trump and called President Obama a "dictator." Also on Wednesday, LePage clarified his comment from yesterday that Trump needed to show "authoritarian power," saying he misspoke and meant to say "authoritative." Democrats are pointing to polls that show Trump on the decline and the lack of support he is getting from most high-profile Republicans. But many Trump supporters aren't acting too concerned about all that. They say Trump will exceed expectations and pull off a win, just like he did in the primary.